The world needs to know what I’m saying, and these universities need to know what I’m saying, but I’ve risen up above universities, say well, they’re no good. I had to report to the Creator, say the universities are not suitable, on this planet. They talk about universe, and then they putting something down. That’s not proper. But I said so I’m just going to one day establish my omniversity. And in my omniversity, people can learn everything. And I’m going to do that. I’m going to establish my omniversity. Now you don’t have an omniversity on the planet. “Universe” just means “one thing,” they have to deal with the oneness of things. Over the past few years I seem to have developed a reputation among my friends as an “expert” on Sun Ra. But really, I haven’t even been a Sun Ra fan for very long. It was only in August 2007 that I really discovered Sun Ra. I had heard of him before. I knew he was an innovator in the jazz avant-garde and that he was experimenting with electronic music way before other artists got into it. But it was in August ‘07 that I found in the Brooklyn Public Library a VHS copy of Robert Mugge’s 1980 documentary Sun Ra: A Joyful Noise. I took it home, popped it into my decrepit little VHS/TV combo thinking I’d watch it while doing some other work. Long story short, I got completely engrossed in it, and blown away by it. I was already pretty well-versed in the history of jazz with a decided preference for the bebop and post-bop sound – Thelonious Monk, Art Blakey, Miles Davis, Charles Mingus, and so on. (The version of ‘Round Midnight that they played in A Joyful Noise just knocked me out!) I also happened to have stumbled on to Sun Ra during a time when I was re-engaging with black nationalism and Afrocentric thought. 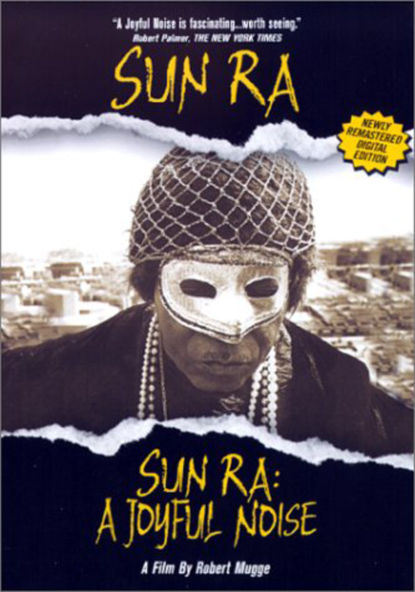 In fact, Sun Ra seemed to tie together several different fields I was reading through at the time, including African-American comedy and satire, anthropology and science fiction. On the occasion of Sun Ra’s 100th arrival day I wanted to share a few thoughts here about why I have found Sun Ra’s work so fascinating. I realize there are plenty of people out there way more knowledgeable about his body of work than I am. My meager knowledge about the Arkestra is nothing compared to other people who I’ve met who saw the Arkestra in its heyday when every concert was truly a happening. But I have seen the Arkestra perform live three times now, in Central Park, at Sullivan Hall, and the Studio Museum in Harlem, and though the spectacle might not be as a grand as I’ve heard about and seen in old footage, the band still brings the energy and liveliness to every show. Unfortunately I missed their performances in the past few months at Lincoln Center and at Drom, and the band is currently on tour in Europe. But I fully expect to be in line for the next shows back in the states when they return. As I said to a friend I spoke with recently, the thing that immediately struck me about Sun Ra’s music is that it sounded like nothing I had heard before, and everything I had heard before. In the Arkestra’s performance I heard New Orleans jazz, blues, gospel, swing, be-bop, funk, Afro-beat, and the classical avant-garde. The performances included a melding of other art forms including drama, opera, poetry, the sermon, spoken word, dance, and fashion. I’ve been thinking about the complexities of Afrocentricity for years now, and what I saw in A Joyful Noise made me marvel at Sun Ra’s Afrocentric imagination. I was first introduced to Afrocentric thought in college, reading through copious amounts of George G.M. James, Cheikh Anta Diop, Martin Bernal, Molefi Asante and Frances Cress Welsing. I also read the serious critics of Afrocentricity and took their counterpoints to heart. (And by serious critics, I specifically exclude the white supremacist reactionaries, though I read them too.) I ultimately settled on something akin to Wilson Moses’s take on Afrocentricity in his book Afrotopia: The Roots of African American Popular History. I’ve always been suspicious of romantic racialism, and I completely reject the patriarchy and homophobia that permeates way too much Afrocentricity, but I also appreciate it as folk history, as a popular intellectual tradition created on the margins of the formal academy, and as a body of work which introduced many young black people to an interest in history and an intellectual practice that they might not have encountered otherwise. What appealed to me about Sun Ra’s version of Afrocentricity that I saw in A Joyful Noise (and which I later discovered in more of his work) was the playfulness in his mythology that seemed to bypass all the self-righteous true-believerism of a Karenga or an Asante, and that circumvented the dour seriousness of doctrinaire Afrocentrics. And by linking Afrocentric thought to futurism Sun Ra also circumvented the trapdoor of nostalgia by not resting on the past but also projecting into the future. 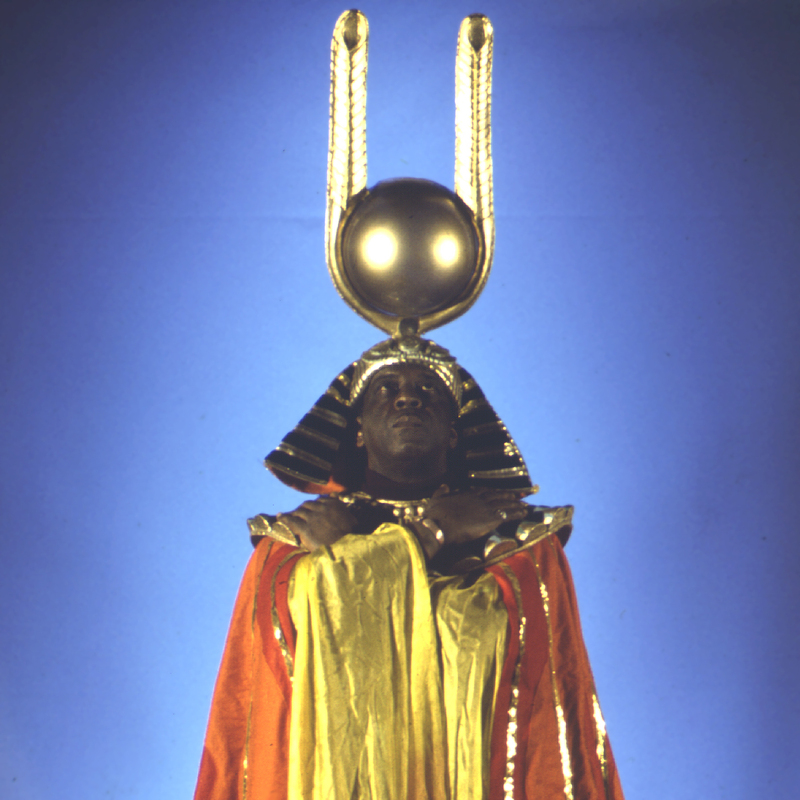 While it is easy to mistake Sun Ra’s veneration of ancient Egypt as a simple nostalgia, he was, at the same time, preaching a futuristic vision of science and technology in which he embraced all the newest electronic instruments, embraced the technological wonders of space travel, and called for a cosmic consciousness beyond the reaches of this one isolated planet. I was also fascinated by Sun Ra’s insistence on the principles of “discipline and precision.” I heard in those words an intentional confrontation with the idea of “freedom” in jazz improvisation. As he was known to say, he played P-H-R-E jazz and not F-R-E-E jazz. In his dialectical ruminations on the nature of freedom and discipline Sun Ra was also theorizing black art and challenging ideas of black primitivism taken up by so many white intellectuals. The Arkestra’s long, arduous practice sessions were legendary, and by emphasizing the notion of discipline, Sun Ra was cleverly exploding the myth that the black artist somehow crawled out of the womb already knowing how to play soaring improvised solos. He was disrupting that condescending idea about jazz that was popular among white beatniks, that anyone could perform black music by simply sloughing off one’s Western rationality and getting in touch with the wild, untrained, primitive self. On the contrary Sun Ra preached that discipline and precision were necessary to operate at the highest levels of any art form. There was spontaneity in the Arkestra’s performance, sure, but that was what Sun Ra spoke of as “spirit.” And that spirit found its expression through discipline, and was activated at the moment of performance. Without that discipline there would be no art. I also appreciate the difficult side of Sonny the bandleader. He definitely had his authoritarian tendencies with the way he ran the Arkestra. Many musicians weren’t willing to put up with the demand for complete devotion to his program. One thing I appreciated about John Szwed’s biography is that he didn’t shy away from discussing the complexity and contradictions of the man born Herman Blount who created Sun Ra as a character. And Sun Ra never disavowed the fact that this was a mythological character that he intentionally created. Taking on the persona of an “angel,” of an alien being outside of the human race, allowed him a certain estrangement from society, and from that estranged position he could make objective observations about this so-called civilization on Planet Earth. Sun Ra is now seen as one of the most important figures in a movement that has come to be called Afrofuturism. I like to put Sun Ra’s ideas in conversation with another of my favorite Afrofuturists, Octavia Butler, particularly in her novels The Parable of the Sower and The Parable of the Talents. In the Parable novels, Butler writes of a philosophical system called Earthseed, a belief system that the book’s main character Lauren Olamina hopes will eventually take root among the stars. Lauren believes that if humanity survives at all, it will have to do so on places other than Earth, and with cosmic values that are beyond these destructive ones cultivated on this planet, values that would allow for survival in the outer worlds. When I decided to create this blog I borrowed the title of Sun Ra’s 1971 Berkeley course The Black Man in the Cosmos. I had grandiose plans to explore the syllabus in detail and include some close readings of works on the list, but, well, life and the dissertation intervened. Still, I’d like to get back to that plan eventually. It was because of that syllabus that I was introduced to the writings of Henry Dumas, and I listed his short story “The University of Man” (collected in Echo Tree) among my short works of black academic fiction. Yes, the mythologies of Earth will continue to involve nations and races and religions and all the other ways that humans have found to categorize and identify ourselves. But stepping out into a cosmic perspective, as Sun Ra did, reveals a story of one planet and of one particular species of beings dominating life on that planet. Whether these beings can find a way to survive on this planet, let alone elsewhere in the cosmos, is a story not yet written. Campbell, Joseph. The Inner Reaches of Outer Space: Metaphor as Myth and as Religion. New York: Harper & Row, 1986. Dumas, Henry. Echo Tree: The Collected Short Fiction of Henry Dumas. Minneapolis: Coffee House Press, 2003. Moses, Wilson Jeremiah. Afrotopia: The Roots of African American Popular History. Cambridge: Cambridge University Press, 1998. Szwed, John. Space is the Place: The Lives and Times of Sun Ra. New York: Random House, 1998. Check out this 2013 interview with Robert Mugge, director of Sun Ra: A Joyful Noise.